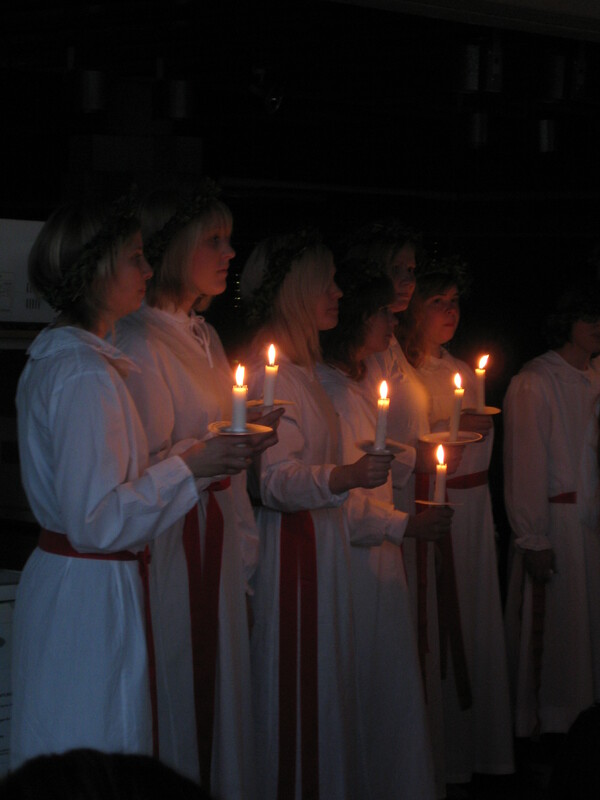 When I was eight-years-old , I secretly decided that I was going to do St. Lucia Day. After thorough re-reading of my American Girl Doll books (Kirsten's Surprise: A Christmas Story, found here on Amazon f0r 6 USD), I determined that I needed (1) a crown with candles, (2) a long white dress, (3) increased braiding abilities, (4) a dozen bagels, and (5) a proper lesson in how to use the family coffeemaker. Due to a test the following morning in school I didn't want to go to, I also decided December 11 was a great day to be Lucia, and at 5 in the morning, I toasted all the bagels in the house, broke our family coffeemaker, and knocked on the door of my parents room with the advent wreath on my head. My parents were, outside of surprised (and later annoyed by the lack of a functional coffeemaker), enchanted. Very typical. I have no idea what this is. Extremely happy to find this. Adorable. I had two friends in a local Göteborg choir that were going to be singing that morning, so at eight in the morning, I was one of the rowdy few in Humanisten sipping coffee waiting for them to come up the stairs. I was laughing and joking with others at the table, but then, the lights dimmed, and I quickly turned around to watch Lucia and her followers file in, singing, from down the hall. After the procession filed out, I had that old, elated feeling of being in a completely new country swept over me again. It's funny: with the holiday break coming up fast, homework and homesickness has been piling high for a lot of us international students. But here I'd like to stress the importance of going out anyway and feeling the true reality of your decision to come study abroad: go experience something, make it your own, and bring a story back. Odds are, it'll be the better gift to your family than a pair of traditional mittens.